Prior to seeing Black Panther, I was largely unfamiliar with both Nakia and Okoye. Fortunately, the movie fixed that for me, and in fact I found both characters to be immensely entertaining and a great addition to the MCU. Sure, they weren’t M’Baku or Shuri, but they were still solid supporting cast members. Seeing as the two of them essentially never leave T’Challa’s side, they’ve found their way into just about every format of figure, including the Minimates, where they’re even packed together. 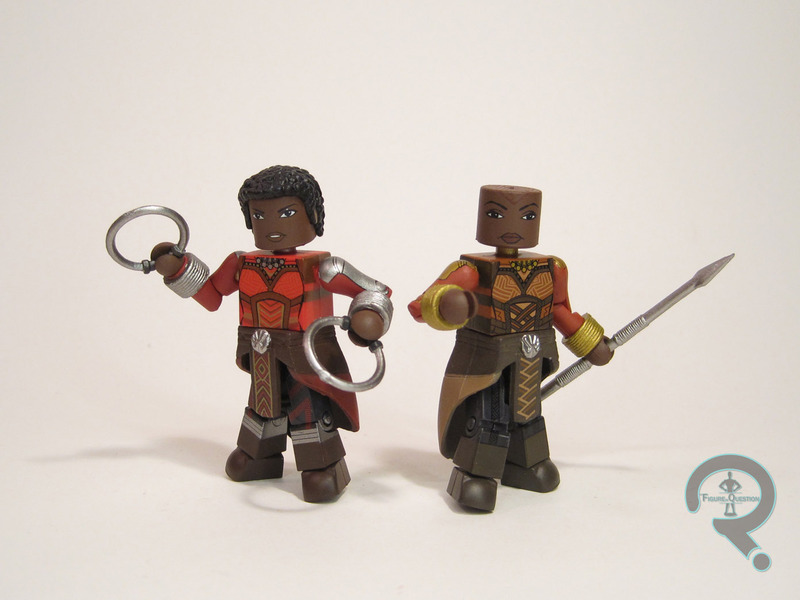 Nakia and Okoye are the Toys R Us-exclusive pair from the Black Panther assortment of Marvel Minimates. They shipped alongside the non-exclusive Black Panther/M’Baku and Killmonger/Klaue sets. Okay, so, right off the bat, this figure’s a bit of a misnomer. Nakia is not a part of the Dora Milaje. She *is* wearing one of their uniforms (since it was what was available in the few moments before she charged into battle), but that hardly makes her one of them. In fact, it’s kind of an important plot point that she’s not bound to their oaths. So, yeah. Nakia is based on the standard ‘mate body, so she’s roughly 2 1/4 inches tall and she has the usual 14 points of articulation. The figure has four add-on pieces for her hair, belt/skirt, and wrist bands. All of these are new to Nakia, and they work pretty well for her. I think the shaping of the hair is a little off; it should be more top heavy than it is. The paintwork is pretty solid. The likeness is sort of generic, but it’s not awful. The details on the uniform are sharp and cleanly applied, and she’s quite on the colorful side, which is always a plus. Nakia is packed with her pair of hoop blades, as well as a clear display stand. Okay, so Okoye *is* one of the Dora Milaje. In fact, she’s the leader of the Dora Milaje, so the title here is definitely appropriate. Structurally, Okoye is essentially identical to Nakia. Same belt/skirt, same wrist bands. The only actual difference is her lack of hair. Seeing as it’s a uniform, the shared pieces are certainly acceptable. The difference between these two is just paint. Okoye’s paint is still somewhat similar, of course. The details are sharp on her uniform, and her likeness is actually pretty darn spot-on. The slight change in her color denotes her higher rank as well, and, like Nakia, she’s quite colorful. Okoye includes her staff and a clear display stand. This set is ultimately the main reason I ended getting the whole assortment of Black Panther ‘mates. After seeing the movie, Super Awesome Girlfriend wanted Pop!s of Nakia, Shuri, and Okoye. 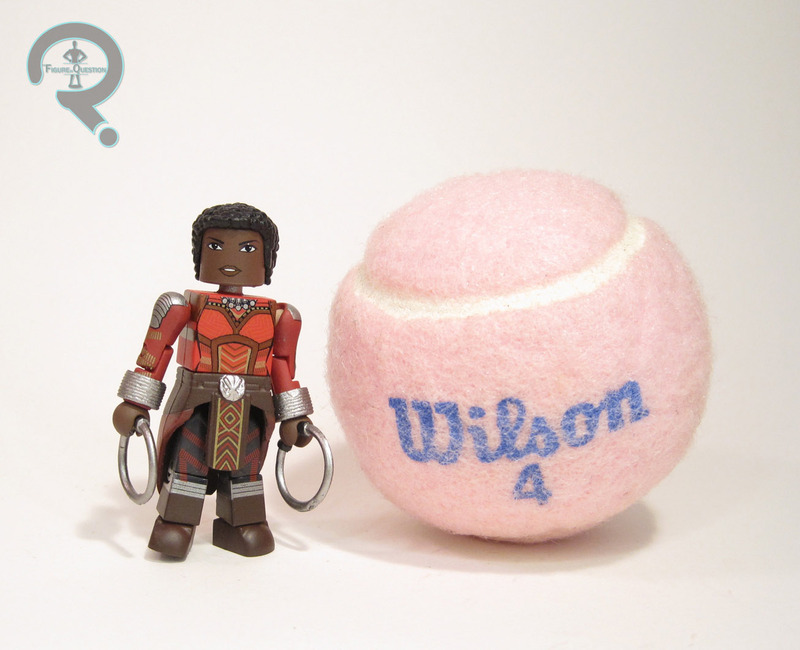 Unfortunately, Okoye isn’t available at regular retail. So, this set is another joint custody item, purchased so that SAGF could have some version of Okoye.